The Egyptian culture minister who lost the race to become head of Unesco has accused the United Nations of becoming "politicised". 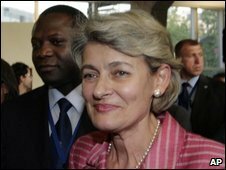 Farouk Hosny was defeated in his bid to become the organisation's cultural head on Tuesday by Bulgarian Irina Bokova. Mr Hosny, who would have been the first Arab to hold the post, said he lost because of "Zionist pressures". 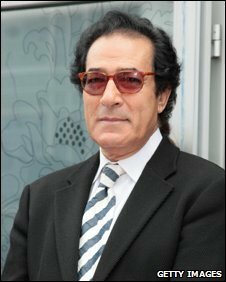 Last year Mr Hosny said he would burn "Israeli books in Egyptian libraries". He later apologised for the remark. "The organisation has become politicised," Mr Hosny told reporters at Cairo airport on Wednesday. "The reality is that we waged a fantastic battle. The Egyptian candidate had the newspapers and Zionist pressures against him every day," he said. The minister described the race as a battle between north and south. "The north always has to control the south," said Mr Hosny, adding that "the American ambassador did everything he could" to stop his election. The Egyptian press echoed Mr Hosny's remarks. "A clash of civilisations determines the Unesco fight, " read the headline of the independent daily Al-Masry Al-Youm. The opposition weekly Al-Ahrar wrote on its front page about "a ferocious campaign against him by the American administration, under Jewish pressure". But in Egypt Mr Hosny, who has been culture minister for 22 years, is a controversial figure. He has been criticised for censorship of literature or cinema that was considered critical of the government or too risque. He has also been criticised by the more conservative members of Egyptian society. In 2006 he criticised women who wore the hijab saying it was "a step backward for Egyptian women". Mr Hosni is close to President Hosni Mubarak, who Mr Hosny said, had told him after the result to "put everything behind you".